The European Foundation for the Improvement of Living and Working Conditions (Eurofound), a tripartite EU agency, has published the report ‘Working conditions: Parental and paternity leave – Uptake by fathers’, produced for the European Commission in the context of negotiations on a work-life balance package for families and carers. The report presents the currently available national statistics on the uptake of family-related leave by fathers over time across the EU28 and Norway, based on information compiled by the Network of Eurofound Correspondents. 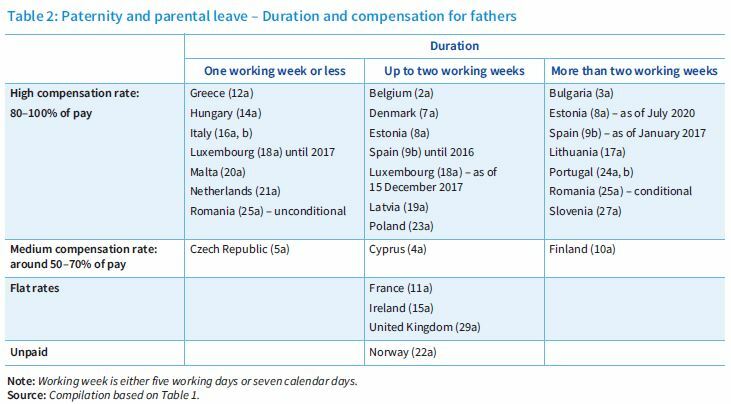 It gives a comparative overview of the main features of the various leave arrangements available for fathers, including information on duration, compensation, eligibility and the number of beneficiaries captured in the data. Despite the unevenness and lack of coherent statistics, the report concludes that in several Member States progress has been made in increasing the number and share of fathers who are taking parental or paternity leave. However, obstacles remain. The report notes that fathers take or forego their entitlements based on a diversity of reasons. First, contextual factors such as societal attitudes may be influencing from the start what kind of family leave arrangements exist and their design, how rigorously their uptake is supported within employers, and how strongly they are adopted by fathers. Second, household decisions about joint income and opportunity costs in terms of foregone wages and career advancement represent the most tangible determinant for taking the leave entitlements, tending to reinforce the traditional model of male earner-female carer. Finally, individual (age, education) and job-specific factors (industry, company size, childcare availability), as well as job security, strongly influence fathers’ decision to take leave.